Thomas Arthur Guy Hungerford was born and raised in South Perth. In his younger years he resided at 254 Mill Point Road, now known to locals as the ‘Bookcaffe’. During the 1920’s the Hungerford family ran a cornershop from the building (for more information on the building click here). Tom was an avid writer. He wrote novels, poetry, short stories, children’s fiction, plays and articles. Tom will be best remembered for his boyhood recollections of South Perth, recorded in the book Stories from Suburban Road. In addition to his contribution to South Perth’s history, Tom was awarded the Order of Australia in 1987 for his greater contribution to Australian literature. Dion Carle, overall winner of the 2011 Phillip Pendal Young Heritage Award, interviewed Tom as part of his research for his essay ‘Tom Hungerford’s Home’. This is believed to be Tom’s last interview. Hungerford’s books can be located at South Perth Library and Manning Library in the biography sections under ‘HUN’. The Local History Collection holds a file dedicated to Hungerford which includes newspaper clippings and articles that interested persons can view by prior arrangement. This entry was posted in Uncategorized and tagged literature, Manning Library, Order of Australia, Phillip Pendal, South Perth, South Perth Library, Stories from Suburban Road, Suburban Road, T.A.G. 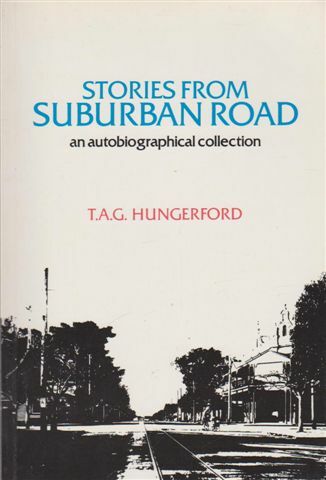 Hungerford, Tom Hungerford by Local History @ South Perth. Bookmark the permalink.